Every now and again I get requests from my readers for a twist on a traditional dish, like mac ‘n cheese, meatloaf, etc… Well the other day I was called upon by one of my Facebook followers to make chicken parmesan interesting for her finicky daughter. Chicken Parm!? How the heck do you make that more interesting? But I aim to please and try to fill as many requests as possible, so I sat down and gave it some serious thought… which net me a whole lotta nothin’. Instead my mind started to wander, and I suddenly had a craving for shredded pork. Mmmm, shredded pork… Hold on a sec. Maybe shredded chicken? Eureka! I got it, why not a deconstructed chicken parmesan? Shredded chicken tossed with the toasted panko that you would normally crust the cutlet with, and top it with a warm tomato salsa instead of sauce, and some shaved cheese. And instead of dry white meat why not use thighs for a more tender end product? Perfect! On the side I served a little pasta in a tomato garlic cream sauce. I know it seems like there is a lot going on in this dish, but trust me when I say it’s super easy to make. I will warn you though, it makes a LOT of dirty dishes… lol. The first thing to get started on is the chicken. Like I mentioned above, I prefer to use thighs with bones and skin because I feel they have more flavor, and are more tender, when cooked, but if you want you can go with boneless/skinless thighs. Put the chicken in a baking pan, add a 1/4c of chicken stock and the butter, then sprinkle with 1tsp each of salt, pepper, garlic powder and dried basil. Cover with foil and cook in the oven for 45 minutes. While the chicken is cooking you can prep your salsa. In a bowl combine the diced plum tomato, garlic, olive oil, salt, pepper, basil and oregano. Cover and set aside at room temperature. You can also get the panko ready. Get a sauté pan hot and add your panko, stirring regularly as it will brown quickly. Once browned remove it from heat and toss in 1/2tsp each of salt, pepper, dried basil and garlic powder, as well as the 1/4c of grated parmesan. Set aside. After 45 minutes remove the chicken from the oven, uncover and allow to rest for about 15 minutes so it is cool enough to handle with your hands. While the chicken is cooling get the pasta working. Boil your pasta in salted water for two minutes less than directed on the packaging. While it’s boiling get a sauté pan or medium pot and heat your olive oil at medium-high. Add your garlic and lightly brown, then add the diced plum tomato, salt and pepper. Cook the tomatoes for about a minute then add the heavy cream and chicken stock. Bring to a boil then reduce the heat to low and allow to simmer. Once the pasta is cooked drain it and add to the sauce, along with the grated parmesan cheese. Stir well and continue to simmer at low heat until ready to serve. This allows the pasta to finish cooking in the sauce itself, which creates better flavor. By this point the chicken should most definitely be cooled enough to comfortably handle. Remove the skin. Using the tip of a fork shred the meat off of the bone, break apart any larger pieces. The chicken may still have a touch of pink to it as you get close to the bone but that’s ok because you’re going to finish cooking it through. Heat the olive oil in a sauté pan or sauce pot at medium, add your shredded chicken and 1/4c of chicken stock, cook for three minutes, stirring periodically. Add the panko/seasoning mixture and stir well to evenly coat the chicken, cook for an additional three minutes. While the shredded chicken is cooking you can do the final step, which is warm up the tomato salsa. Heat a sauté pan or sauce pot on medium, don’t add any butter or olive oil as the prepped salsa already has oil. Simply add the salsa to the hot pan and cook for two to three minutes, stirring periodically. You don’t want to cook the tomatoes to the point that they’re mushy, you just want them brought up to temp. Everything is cooked, now you’re ready to bring it all together. 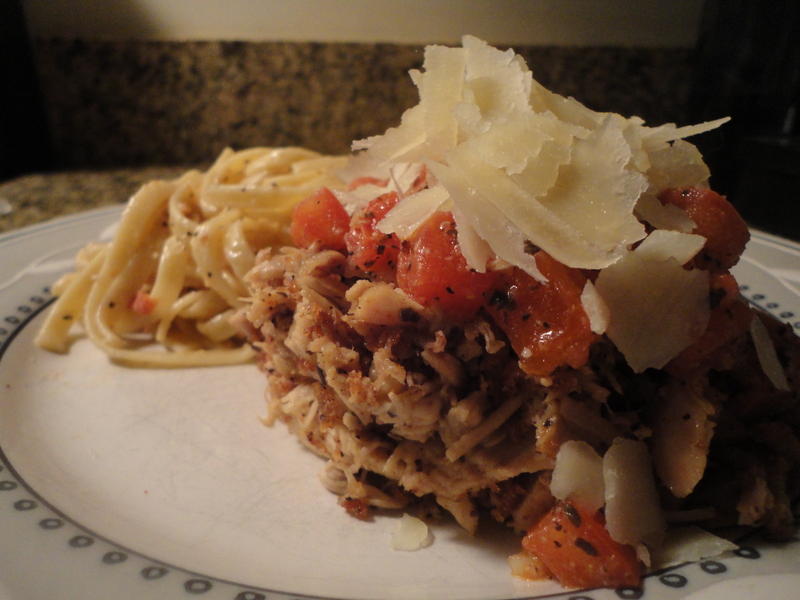 Plate the chicken, then top it with the warmed tomato salsa and shaved parmesan, and plate the pasta in sauce along side. Viola, you’re done! Congrats, you just took a boring dish and made it new and exciting. So that’s my recipe and my pairings. I’d like to think that I successfully breathed new life into a tired old dish found in every “pizzeria ristorante” across the country. As always there is new content on the way. In the meantime crack open an inexpensive Italian gem (that isn’t Ruffino! ), sit back and relax. Life is short, enjoy it! Tags: chicken parm, chicken parmesan, chicken pasta, perfect pairings, perfect pairings at home. Bookmark the permalink. Looks and sounds amazing. Chicken parm is one of my all-time favorites and this is a great take on it. Thanks for sharing your recipe and wine suggestions!